Princess Cruises said today that the new Royal Princess will have a new stateroom type, Deluxe Balcony Staterooms, which are between a Balcony stateroom and a Mini-Suite in the hierarchy of categories. In additional all staterooms will have some subtle new features based on feedback from Princess passengers. At the same time, to promote the new stateroom type, Princess is having an eBay auction for one, which will allow the winner to be the very first to book on the new ships. All the proceeds from the auction will go to charity. CND subscribers also read about a medevac from Carnival Liberty ... videos from aboard Costa Allegra ... and the end of a search. Passengers who were aboard Costa Allegra for three days without any power - or the conveniences it makes possible - are getting their land legs back, either at home or at a resort hotel in the Seychelles, paid for by Costa Cruises. It seems they've hardly had time to get that hot shower so many wanted, and some of them were on their computers posting videos from their time aboard the ship without power. Some are complaining, most are not. Costa made them a very fair compensation offer, which we reported earlier. Passengers are essentially getting double their money back for the cruise and all their travel expenses (air fare, hotels, and whatever else they spent), all onboard charges waived, and either an expense-paid stay of up to two weeks in the Seychelles or a future cruise voucher equal to the value of what was left of their cruise on Monday when the fire broke out. (Passengers were disembarking at various ports over the next month.) Costa says that 481 passengers of the 627 opted for the free stay in the Seychelles; the rest departed Thursday evening on flights for European destinations. The complaints seem to center on the crew not responding with absolute precision when the fire broke out, or that there was a fire at all. The videos below, shot by passengers, depict the conditions aboard the ship. Conditions certainly aren't what the passengers expected, or what Costa wanted to provide on the cruise, but they also don't look as horrible as the news media keeps trying to portray them, either. 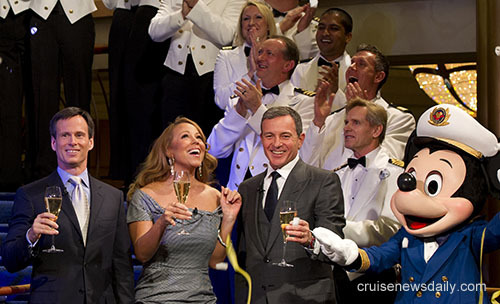 Disney newest ship, Disney Fantasy was christened last night in New York by godmother, singer Mariah Carey, shown in the photo and video below. In an unusual ceremony (probably designed around the ship being christened in New York in the winter) Carey led the audience in a countdown that triggered a 6-foot tall bottle of champagne in the Atrium Lobby to erupt and shower onlookers with confetti and streamers as a traditional bottle of champagne broke against the ship’s hull. Disney Fantasy enters service from Port Canaveral on March 31, 2012. Disney Fantasy left New York Friday afternoon (March 2, 2012) about 4:30pm en route to her home port in Florida. As she left, one of our favorite videographers NJPhotographer62 on YouTube took this short video of the departure with the added bonus of a short concert on the ship's whistles as it says good-bye to the Big Apple. As expected, Costa Allegra arrived in Victoria harbor today about noon local time (midnight EST), and within about two hours all the passengers had disembarked. Costa said about 70% of the 627 passengers had taken them up on their offer to continue their vacation for up to two weeks at a quality resort in the Seychelles at Costa's expense. The rest went to hotels to spend the day (to take hot showers and get hot meals, no doubt), and tonight they are on their ways home. If the cruise industry were a TV game show, Norwegian Cruise Line would be the winner because they got to the finish line before their competitor, Carnival. But it's not a game show. There's just a race to bring game shows aboard the ships. CND subscribers also read about a very entertaining Princess Cruise (More) ... Carnival scores a perfect 400 last month ... Washington politicians find something new to investigate - the cruise industry. Costa Crociere reports that Costa Allegra has arrived and docked at Port Victoria on the island of Mahe in the Seychelles. Disembarkation by passengers has begun. The cruise ship was disabled by a generator room fire on Monday morning while cruising in the Indian Ocean. It has been towed since Tuesday morning by the French oceangoing fishing vessel Trevignon. Video of Costa Allegra arriving at Mahe is below. Costa Crociere reports that disembarkation of passengers and crew from Costa Allegra has been completed. The process took about two hours. Members of Costa's Care Team are seeing to the needs of the passengers. Costa says that about 70% of the 627 passengers have now accepted Costa's offer of continuing their vacation for up to two weeks at a resort in the Seychelles at Costa's expense. The others are being accommodated in hotels today, and will leave tonight on flights to Paris, Milan via Rome, and to Zurich via Vienna. They will arrive the morning of March 2.
a full refund of the cruise fare paid and associated travel expenses. a full refund of any onboard expenses incurred during the cruise. indemnity equivalent to the amount of the fare paid for the cruise and associated travel costs. those who are not accepting the line's offer of a free vacation in the Seychelles will receive a voucher for a future Costa cruise in the next 24 months equal to the value of their unfinished cruise. The line also said, "Costa Crociere would like to express its gratitude to the master of Costa Allegra Nicolò Alba and all members of the crew, to the Guests of Costa Allegra, to the master and crew of the French deep sea fishing boat Trevignon, to the other naval and air units involved in the rescue operations of the Costa Allegra, to the Italian Harbour Office General Command, to the local authorities of the Seychelles and Reunion, to the Italian Consulate and Embassy, and to international diplomatic representatives." This raw video shows Costa Allegra arriving at Victoria this morning in the Seychelles. In this video, Costa EVP Norbert Stiekema praises the captain and crew of Costa Allegra. In this video, passengers are briefly describing their time aboard Costa Allegra after the fire. Royal Caribbean will build a second "Project Sunshine" ship for their Royal Caribbean International brand. The order for the original ship, placed a year ago, included an option for a second, and just as it was about to expire, RCCL announced today that they would exercise it. A woman was reported missing from Bahamas Celebration, the cruise ship which operates two-day trips to Freeport from Palm Beach. The woman was not reported missing until the ship had returned to Palm Beach this morning, and there are again questions about what happened to the woman because this is one of those cases where there is no evidence she went overboard. The tow of Costa Allegra is continuing today toward Mahe in the Seychelles. The cruise ship was disabled by a generator room fire on Monday, and has been under tow by a French oceangoing fishing vessel since Tuesday morning. A helicopter arrived again today with more supplies, including fresh bread and 400 flashlights. Water, soft drinks and cold foods such as fruits, cold cuts and cheeses, remain in good supply aboard Costa Allegra. A Navy ship also brought eight members of Costa's Care Team who will discuss options with the passengers for their onward travel once the ship arrives at Mahe on Thursday. Passengers do have the option of continuing their vacation in the Seychelles at Costa expense, and so far 376 have said they will do so. The other 251 have opted to take flights home from Mahe Thursday evening. Other members of Costa's Care Team remained on Mahe to ensure everything is ready for Costa Allegra's arrival. There were also two immigration officers from the Seychelles aboard the Navy vessel. They will begin processing the passengers in order to speed their disembarkation on Thursday. The ship is making progress toward Mahe, but it has lost some time, and arrival is now estimated to be at 9am local time (midnight Wednesday EST) rather than 6am as originally anticipated. Below is some raw video of a flyover of Costa Allegra shot on Monday showing the disabled ship in the Indian Ocean, prior to the tow beginning on Tuesday. Update March 1, 2012: Costa Allegra has arrived at Mahe. Video reports are in a later item on this blog. Royal Caribbean Cruises Ltd exercised an option for a second Project Sunshine ship for their Royal Caribbean International brand today. The ship will be built by German builder Meyer Werft at their Papenburg yard for delivery in the spring of 2015. Carnivores, your ship has come in. Norwegian Cruise Line has decided that the popular Moderno Churrascaria restaurant will be available on every ship in the fleet in the not-too-distant future. Norwegian is also extending the option to pre-reserve all specialty to all ships in the fleet, an option previously available only on Norwegian Epic. As CND reported yesterday, Costa Allegra was disabled by a generator room fire in the Indian Ocean on its way to the Seychelles. The fire not only disabled the ship's propulsion but also left it without electricity for hotel services (and air conditioning). Several ships changed course and proceeded toward Costa Allegra. The first to arrive during the night was the French oceangoing fishing vessel, Trevignon. 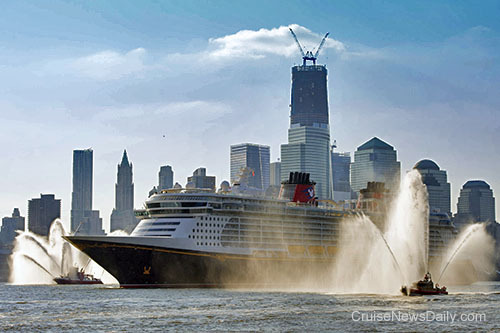 Disney Fantasy arrived in New York this morning where it will be christened on Thursday. We have photos on our blog. 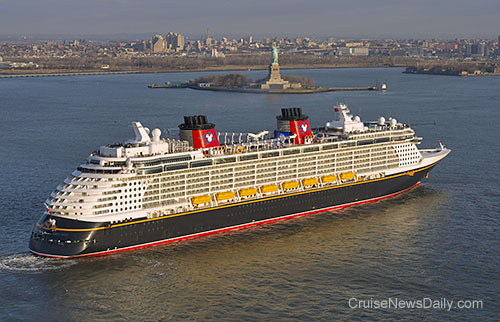 Disney Fantasy, the sister to Disney Dream, arrived in New York today where it will be christened on Thursday. After traveling almost 3,800 miles, the ship arrived in New York from Bremerhaven (Germany), where it completed its sea trials. 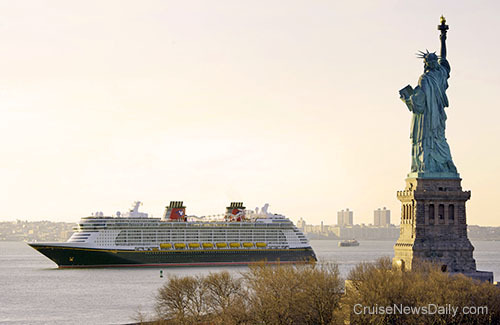 In the photos below, Disney Fantasy can be seen sailing up the Hudson River past the Big Apple's iconic landmarks, including the Statue of Liberty and the new tower of the World Trade Center, and getting a traditional salute by fireboats in the river. Once the christening festivities in New York are over, Disney Fantasy will sail to its home port at Port Canaveral. Disney Fantasy's maiden voyage will sail on March 31. Costa Crociere said Tuesday morning (February 28, 2012) that Costa Allegra, disabled by Monday's generator room fire, is under tow by the by French ocean fishing vessel Trevignon. The destination is Desroches Island where it is expected to arrive Wednesday morning and passengers will disembark. Costa Allegra remains without power for propulsion or hotel services Tuesday. Crew members were able to prepare a cold breakfast for passengers this morning, and passengers have been asked to pack their luggage for disembarkation on Wednesday. Meanwhile Tuesday, a helicopter left from Mahe (Seychelles) for the ship, taking them both food and communications devices (satellite telephones and VHF radios). Costa says it is currently arriving at the ship's location in the Indian Ocean. Costa Allegra lost power on Monday when a fire broke out in the ship's generator room. It was quickly extinguished by onboard fire crews. Original CND bulletin. Complete coverage was in Monday's edition of Cruise News Daily. Breaking: Costa has now decided Costa Allega will be towed to Mahe Island (Seychelles - located on interactive map below) instead of Desroches. Arrival is now planned for Thursday morning. Several elements have factored into the decision to change Costa Allega's destination. A primary one is that Desroches does not have adequate facilities for safely docking Costa Allegra and disembarkation, so passengers and their luggage would need to be tendered ashore. There would also be major logistical problems for passengers, since the island does not have enough hotel facilities, and a ferry transfer to Mahe would be required. In addition, repair facilities (and workers with the technical knowledge to carry out the repairs) aren't available on Desroches. Two oceangoing tugs are now nearing the ship, and will assist with towing it to Mahe, which will increase the speed. Arrival at Mahe is now expected on Thursday morning (March 1, 2012) a approximately 6am local time, which is about the time passengers would have arrived there had the ship been towed to Desroches and they had then been ferried to Mahe. Costa says helicopters will ensure a continuous supply of food, comfort items and flashlights are available aboard Costa Allegra to make the passengers as comfortable as possible. This afternoon, three more ships - another fishing vessel and the two tugs - joined Trevignon, which is still towing Costa Allegra at a speed of approximately six knots. They will assist if necessary. A Navy ship which is escorting Costa Allegra has given them a small generator to provide some electricity aboard. Meanwhile, Costa's "care team" has arrived on Male to make sure everything is ready for the passengers' arrival on Thursday morning. Eight of the group along with two Seychelles immigration officers will be transported to Costa Allegra on Wednesday to discuss the arrangements for the passengers once they arrive on Male. Twenty-two passengers ashore from Carnival Splendor in Puerto Vallarta on a Carnival-sponsored shore excursion bus were robbed at gunpoint last Thursday afternoon. None of the group was hurt, and they all returned to the ship safely. In this CND report we look at the cruise line's interesting reaction to the turn of events in Puerto Vallarta, and why we believe they responded (or not) as they have. to its home port of Galveston. The ship was reportedly about 100 miles southeast of Galveston at the time. The complete text of these stories appeared in the CND editions referenced and was sent to subscribers. A fire broke out this morning in Costa Allegra's aft electric generator room while the ship was sailing about 200 miles southwest of the Seychelles and about 20 miles from Alphonse Island. A general alarm was sounded, and passengers and crew members went to their muster stations. The shipboard fire suppression systems were activated, and the ship's special firefighting squads extinguished the blaze. The fire was contained to the generator room. The ship is currently without power, and inspections are underway to determine damage and if the generators can be restarted. The ship sent a distress signal, and all relevant authorities were notified. The Maritime Rescue Control Center in Rome is following the situation and ready to provide any necessary support. Several vessels are headed toward Costa Allegra to provide assistance. The nearest was a French oceangoing fishing vessel which arrived Monday night. The captains of the two vessels have been in radio contact, and at dawn they will decide what assistance the fishing vessel can be to Costa Allegra. There are 636 passengers aboard the 28,597-ton Costa Allegra along with 413 crew members.